I remember writing an inland letter on behalf of my grandma. She was writing to her brother in Dehradun. This was before email or mobile phones so obviously, letters were how news of things was exchanged. It was a tedious process. The inland letter had four sides which she made up fill up quickly. As a parting message, she wanted me to mention her failing health (false news). I brusquely told her no. I believe an argument followed and she won it. But what was more fun was the fact that we would walk up to the nearest post box, the red, cylindrical metal box, propped up on every second street then, and then quickly post it via the slit. Then began the wait – the postman would pick up the post real soon and the letters, postcards etc. would soon reach their destination. Yes, there was hope. The red post box of my childhood and yours is fast disappearing. We have a lot to say but nothing to write to. We chat, we call, and we talk. We don’t write to each other anymore. Instant gratification is all we want. Hope is lost. 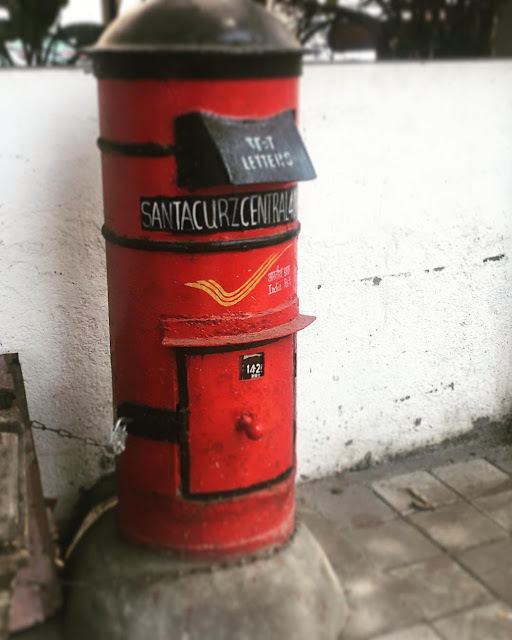 I found this post box right outside of Nanavati Hospital and it filled me with childish glee. What is the first thing this postbox bring to your mind? P.s. if you had to write to someone if the email was unable, who would you write to?